Kerry blue terrier dog breed has originated in Ireland where they are often known as Irish Blue Terrier. They were made to control vermin but over the time they have become a working breed used for herding, and guarding purposes. 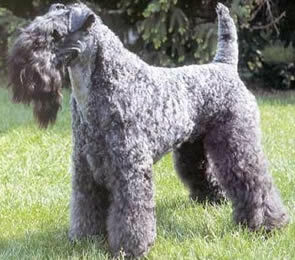 Despite having won a Crufts in 2000 in the UK dog show competition, the Kerry blue terrier breed has remained uncommon. It is a happy, active, boisterous and lively breed which brings happiness in your lives. Kerry blue terrier is a perfect friend and good with other animals. It does show a protective nature because of which it can make a good guard dog but it does not attack anyone unless instigated. It is an adamant breed that loves challenges. It obeys instruction but just like a few other breeds this one too gets bored with repetition and hence the master should know a number of tricks to amuse as well as train the puppy. Moreover strict yet loving methods must be adopted to make it well behaved. It should never be left alone with small children. The breed is sure to make a dull moment lively and is friendly around foes and friends alike. It has a smooth, wavy and thick coat which needs a lot of maintenance to keep it beautiful. This breed should be combed on a weekly basis to avoid tangling and bathed every week as well. Moreover, ear hair should be plucked on a regular basis to avoid ear infections. Even though small amount of exercise or one long walk per week may suffice, the breed indeed enjoys long walks with his companion because of his high energy.